The following timeline of diaconal history is by no means exhaustive, and places a particular emphasis on the Canadian context and on the emergence of CCS, but if gives you a sense of development of the diaconate over the years. The Hebrew Scriptures do not mention diakonia. However, within such traditions as the mid-wives, prophets, levites, collectors of alms, synagogue attendants and the call to care for the widows and orphans, there are interesting connections and parallels to diaconal ministry. Diaconal ministry has its roots in the Christian Scriptures: Teachings of Jesus. The Greek word diakonia means service, and is used many times throughout the gospels. Luke has Jesus use this word to describe his ministry, “I am among you as one that serves” (Luke 22:27) In the gospels, Jesus also uses the word in order to offer his vision of the ministry to which we are all called; “If anyone would be first, they must be last and servant of all” (Mark 9:35 ). In Epistles of the Christian Scripture diakonia is also used as a noun, to signify office and function (Ephesians 4:11-16) and, diakon, to name the person who performs the service (1 Timothy 3:8-13). In the early church, the diaconate went through many changes and was understood in a variety of ways. In the1st century, a three-fold ministry -the offices of deacon, presbyter and bishop, emerged; but the roles were often interchangeable and loosely defined. The role of the diaconate included care for the poor, teaching, administration, liturgy and preaching. By the 2nd century, the ministry roles were becoming hierarchical. The role of the diaconate included most of the same functions but the assignment as the bishop’s assistant was developed and a whole range of sub-diaconate roles were identified – acolytes, exorcists, readers, doorkeepers, singers. By the time of Constantine in the 4th century, the diaconate was relegated to an inferior status. They were banned from the celebration of eucharist and ceased to form part of the bishop’s staff. Ministry within the early church moved from an organic understanding and organizational model where rank and status were not considered to a highly ordered structure where hierarchy and position were emphasized. Alcuin, the English scholar and deacon, died in the early 9th century having created and run a number of schools and training centres throughout Europe. By the middle ages, the diaconate had all but dropped out of the western world -with only a few notable exceptions in the eastern church. The Catholic Church, to an extent, the Church of England, retained deacons on the “preparation for priesthood” model. For most clergy it was an apprenticeship through which to pass on the way to higher office. Traditionally, the medieval Roman Catholic church cared for the poor and marginalized through religious orders and lay fraternities. Even though the official diaconate all but disappeared throughout the rest of the church’s history there have been significant persons and movements that have connected to the spirit of diaconia. In the 13th CenturyFrancis of Assisi formed an order of brothers who followed a simple but strict rule. They were not to own anything at all – except one gown and one pair of sandals. Every brother had to work to earn his food, but he was not to take money for his work. Among those who sought entrance to the company was Clara, a young noble woman of sixteen. Francis welcomed Clara and received her into the order three short years after his own decisive call. She founded an order of women affectionately known as the Poor Clares. The Beguines had a series of spiritual writers who embodied a distinctive blend of pragmatism and mysticism. Some of the Beguines conformed to the notion of the virtuous, chaste, repressed, medieval holy woman. Some challenged the patriarchal confinement of their roles. Always Beguines combined manual labour and concern for the sick and the poor with their prayer lives. Because these women were outside the authority of the church, the church tried to force the Beguines into an official order so that they would be under the control of the church. By 1311 the Beguines were charged with heresy and dismissed. But they continued to survive in underground ways in the14th and 15th centuries. In 16th century Geneva, there were four offices written into Church laws by John Calvin: pastors, elders, doctors and deacons. Deacons were charged with helping the poor and with handling money. Deacons acted as administrators who worked with the poor who arrived in Geneva fromother countries. The deacons were instrumental in setting up funds and they provided training for self-support. They helped and encouraged folks to find employment where appropriate. Deacons tended to be well-to-do gentlemen, considered honest and respected by the community. After Nicholas Ferrar had been ordained as a deacon, by Church of England in the 17th century he and his family and a few friends retired to Little Gidding, Huntingdonshire, England, to devote themselves to a life of prayer, fasting, and almsgiving. They taught the neighborhood children, and looked after the health and well-being of the people of the district. In the 19th century, a Lutheran pastor, the Reverend Theodore Fliedner, undertook to revive the ministry of deaconess for the care of the unfortunate. In 1836, a Deaconess House was established in Kaiserwerth, Germany, in response to the changing social conditions of Germany, and the need for women’s involvement in social reform. Florence Nightingale received inspiration and training at Kaiserwerth, and the uniform and cap of the present-day nurse survive as reminders of the debt owed to the Lutheran deaconesses. This renewed movement spread throughout Europe and began to informally organise – the first Kaiserwerth General Conference of Boards of European Deaconess Houses took place in 1861. The successful work at Kaiserwerth also stimulated the deaconess movement in England and the Americas. The office of deaconess was restored in the Church of England, in the 1860s, when Elizabeth Ferard was admitted to the office of deaconess. She thus became the first woman to hold this historic office in England after the lapse of several centuries. Between 1889 and 1897, over one hundred and fifty institutions were created worldwide to train deaconesses. In Canada during the 1890s alumni of Wycliffe College recruited volunteers to go to England for training and they returned to establish the Church of England Deaconess and Missionary Training House (1892). Later that decade, the Methodist National Training School (1894) and the Presbyterian Missionary and Deaconess Training Home (1897) were founded. Training at these schools integrated biblical, doctrinal and theological work with practical preparation for educational, social and mission ministries (and often also included instruction in book-keeping, elocution, health, early physical education and sanitation). In 1920, Manitoba College, (a Presbyterian College in Winnipeg, MB) established a Deaconess course referred to as the Women’s Department. Also in the 1920s, following the birth of the United Church in 1925, the Presbyterian and Methodist training schools merged and united to become the United Church Training School (1926). In 1939, as Wesley College (Methodist) and Manitoba College (Presbyterian) prepared to merge institutions post-union to become United College, Manitoba College’s Women’s Department was closed. During the bleak economic years of the depression, there were few students in the United Church Training School in Toronto, and few opportunities in the church for employment for women workers. DIAKONIA of the Americas and the Caribbean (DOTAC). By the 1960s,the name of the United Church Training School was changed to Covenant College. In this era of growing world ecumenism, the Anglican Women’s Training College and Covenant College united to become The Centre for Christian Studies. In the 1970s, after several years of experimentations and struggle, a new program of studies at CCS was instituted. The focus was clearly on providing training in educational theory and skills, although the definition of education was vastly expanded to include consciousness raising, social analysis, and strategies for social change, as well as nurturing, counselling and leadership training techniques. In the 1980s several United Church consultations were held to discuss the future of the diaconate. Deaconesses and those who were, unofficially, referred to as commissioned ministers agreed, by consensus, to the new, but historical, terminology diaconal minister. Another United Church initiative during this decade was the Western Field-based Diaconal Ministry Preparation Program associated with St. Stephen’s College in Edmonton. 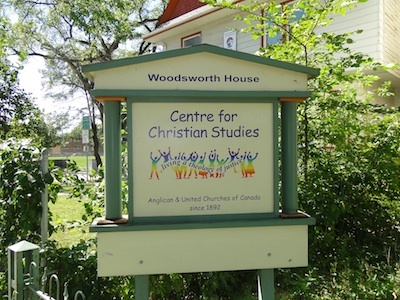 This regionally based pilot project had two intakes, and with the models offered in First Nations theological schools (Dr. Jessie Saulteaux Resource Centre and the Francis Sandy Theological Centre), led to the development of the community based model introduced at the Centre for Christian Studies. During the 1990s many of the dioceses of the Anglican Church were involved in discussions about the restoration of the vocational diaconate. A national conference at the end of the decade called together deacons from across the country for the first time. In 1997, a decision was made to discontinue the residential program that CCS and its predecessors had offered for over 100 years and the regional model is the only one now available. In 1998, the administrative office of CCS moved to Winnipeg, but the heart of the Centre is all across the country.